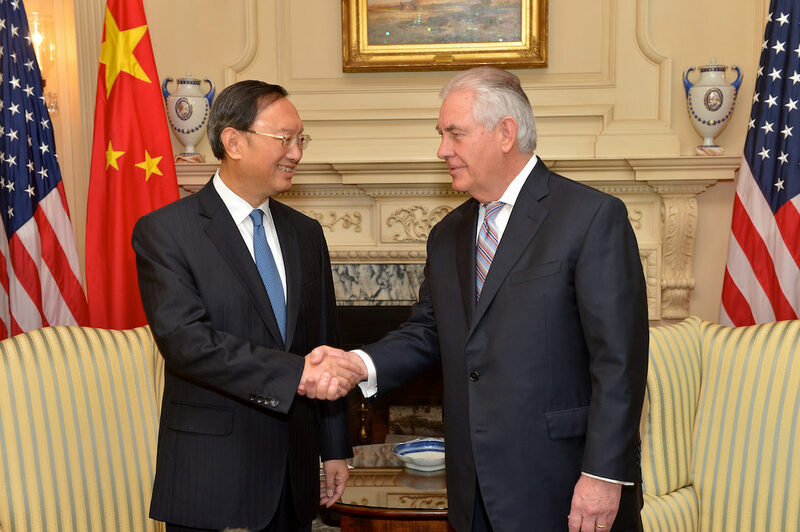 Chinese State Councilor Yang Jiechi (left), shakes hand with U.S. Secretary of State Rex Tillerson in Washington, D.C., on February 28, 2017. Jane Perlez has been a reporter at The New York Times since 1981. She won a Pulitzer Prize in 2009 for coverage of the war against the Taliban and al Qaeda in Pakistan and Afghanistan. She has reported on wars, diplomacy, and foreign policy from Somalia to Poland to Indonesia. Since moving to Beijing in 2012, she’s written about everything from China’s space program to the Dixie Mission—the group of Americans sent to Mao Zedong’s revolutionary base at Yan’an who hoped to establish good relations between the U.S. and the soon-to-be-victorious Chinese communists. Last year, she took over from Edward Wong to become The Times’ Beijing bureau chief. Much of Perlez’s reporting has focused on China’s foreign policy, particularly its relations with the United States and its Asian neighbors. So she is the ideal interpreter as we try to understand Chinese foreign relations in a new age of uncertainty. Goldkorn interviewed Perlez in front of a live audience at the Beijing Bookworm for this podcast.